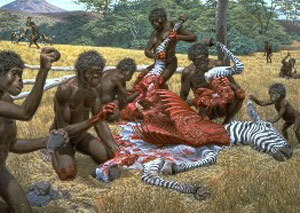 Did ancient butchering tools give evolutionary edge to human communication? Two and a half million years ago, our ancestors in the African savanna crafted rocks into shards that could slice apart a dead zebra, gazelle, or other game animal. Over the next 700,000 years, this butchering technology spread throughout the continent and, it turns out, came to be a major evolutionary force, according to new research from the University of California, Berkeley, and two British-based institutions, the University of Liverpool and the University of St Andrews. The findings of the study, reported this week in the journal Nature Communications, is the largest to date to look at gene-culture co-evolution in the context of prehistoric Oldowan tools, the oldest-known cutting devices. It suggests communication among our earliest ancestors may be more complex than previously thought, with teaching and perhaps even a primitive proto-language occurring some 1.8 million years ago. “Our findings suggest that stone tools weren’t just a product of human evolution, but actually drove it as well, creating the evolutionary advantage necessary for the development of modern human communication and teaching,” said Thomas Morgan, lead author of the study and a postdoctoral researcher in psychology at the University of California, Berkeley. “Our data show this process was ongoing two and a half million years ago, which allows us to consider a very drawn-out and gradual evolution of the modern human capacity for language and suggests simple ‘proto-languages’ might be older than we previously thought,” Morgan added. Morgan and University of Liverpool archaeologist Natalie Uomini arrived at their conclusions by conducting a series of experiments in teaching contemporary humans the art of “Oldowan stone-knapping”, in which butchering “flakes” are created by hammering a hard rock against certain volcanic or glassy rocks, like basalt or flint. Oldowan stone-knapping dates back to the Lower Paleolithic period in eastern Africa, and remained largely unchanged for 700,000 years until more sophisticated Acheulean hand-axes and cleavers, which marked the next generation of stone tool technology, came on the scene. It was practiced by some of our earliest ancestors, such as Homo habilis and the even older Australopithecus garhi, who walked on two legs, but whose facial features and brain size were closer to those of apes. In testing five different ways to convey Oldowan stone-knapping skills to more than 180 college students, the researchers found that the demonstration that used spoken communication – versus imitation, non-verbal presentations or gestures – yielded the highest volume and quality of flakes in the least amount of time and with the least waste. To measure the rate of transmission of the ancient butchery technology, and establish whether more complex communication such as language would get the best results, study volunteers were divided into five or 10-member “learning chains”. The head of the chain received a knapping demonstration, the raw materials and five minutes to try their hand at it. That person then showed it to the next person in the chain, who in turn showed the next person, and so on. Their competence picked up significantly with verbal instruction. “To sustain Acheulean technology, there must have been some kind of teaching, and maybe even a kind of language, going on, even just a simple proto-language using sounds or gestures for ‘yes’ or ‘no,’ or ‘here’ or ‘there’,” Morgan said. “At some point they reached a threshold level of communication that allowed Acheulean hand axes to start being taught and spread around successfully and that almost certainly involved some sort of teaching and proto-type language,” Morgan said. In addition to Morgan and Uomini, co-authors and researchers on the paper are Luke Rendell, Sally Street, Hannah Lewis, Catherine Cross, Cara Evans, Ronan Kearney, Andrew Whiten and Kevin Laland, all at the University of St Andrews in Scotland; Ignacio de la Torre at University College London and Laura Chouinard-Thuly at McGill University in Canada.